The Mens Interval Long Sleeve T-Shirt from Rab is a performance Long Sleeve T-Shirt suitable no matter where your adventure takes you next. 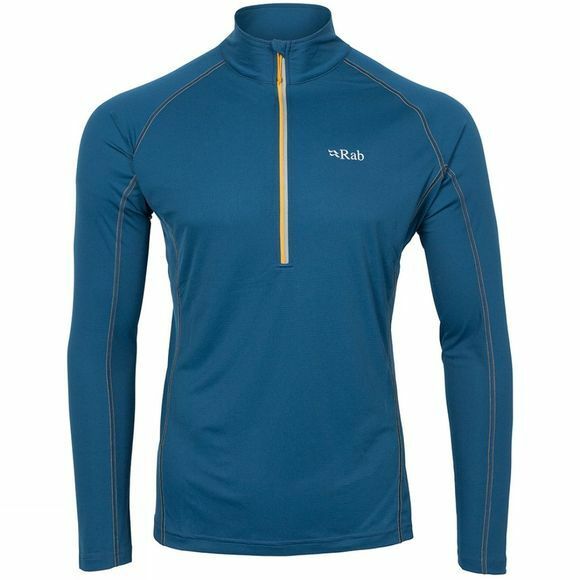 This outdoor t-shirt features performance Motiv-G fabric technology providing the ultimate comfort for everyday use and wear on your next expedition. This t-shirt features polygiene odour treatment so that you can wear the t-shirt for unrivalled comfort on long hot days hiking. This outdoor t-shirt is also fast drying and features high wicking performance meaning that you can stay comfortable for longer. This t-shirt also features 30+UPF treatment meaning that even in the sunshine you can stay warm as well as protected from UV rays. This T-Shirt from Rab will keep you cool and comfortable all summer long. Not the T-Shirt you're looking for? Take a look at our wide range of outdoor and performance T-Shirts for your next outdoor adventure. Founded in the UK, Rab began by specialising in high performance down sleeping bags. Today, Rab produces a range of outdoor kit that frees climbers to go further, higher and quicker than ever before. By using the highest quality, lightweight materials Rab remains at the forefront of innovation and performance. From their super lightweight bivi bags to tough, waterproof and breathable eVent™ jackets, Rab have created some of the most hardwearing and specialist kit in the world.